Ana Hero Asked on 17/09/2015 in English Grammar. With Idol Lips Plumper, you can have sexier fuller lips which can give extra confidence and also energy. After applying this product, your lips will plump quickly in simply a matter of secs. You can take pleasure in having well moisturized as well as well-moisturized lips. This is an excellent item to buy considering that it makes use of the latest innovation and extremely budget friendly with no excruciating adverse effects. Okay! A lot of choices for adverbs that mean “in addition”. I went to the park and I also went to the bank. The use of also is most common in writing as opposed to speech. In speech you would probably choose as well or too. Also can be used to begin a sentence. I went to the park. Also, I went to the bank. It helps you to continue your idea in a different sentence. The final way that you might see also is at the end of a sentence to connect two phrases. This is generally used in American English as opposed to British English. It’s more common for British English to use as well or too at the end of a sentence. I went to the park and I went to the bank also. I want some banana ice cream but I want some chocolate ice cream too! I too was shocked when he got his hole-in-one! I wanted chocolate and she wanted chocolate as well! You can use as well as at the beginning of a sentence. This is generally used in writing. As well as buying the groceries, she also had to go to the vets and the doctors! The words in our list that are used to express something negatively are either and neither. These are both used to make a distinction between a list or a group of different things. I don’t want to go to the cinema and I don’t want to go to a restaurant either! I just want to stay home. Adding either in the above sentence stresses you idea more strongly. I want neither eggs nor ham. I only eat vegetables. Then apart from these words we have so. 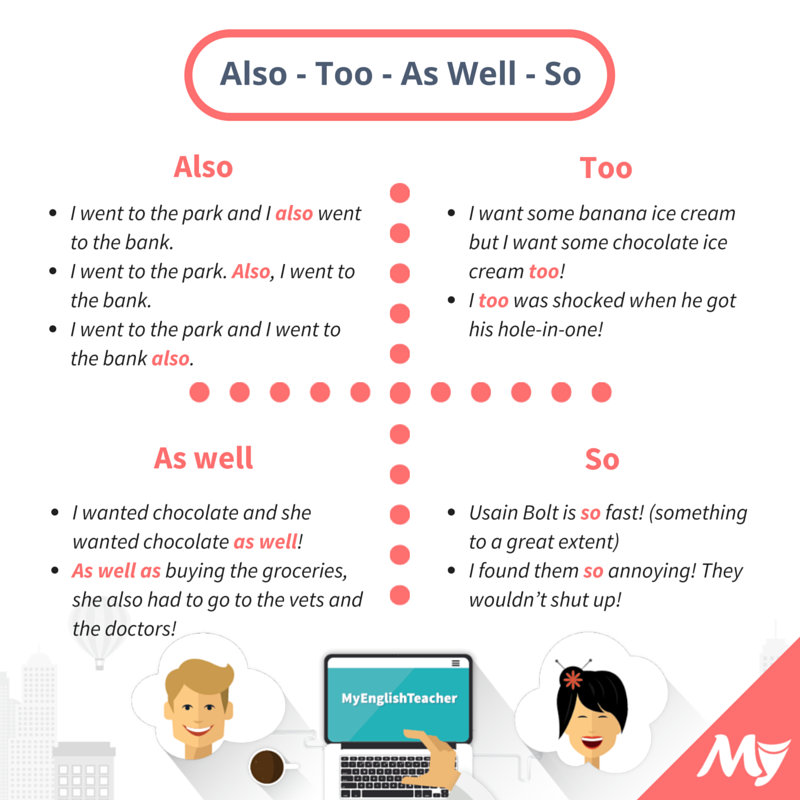 So can be used in a variety of ways but we will focus on its use as an adverb like the other adverbs we have already looked at. So as an adverb can be used to express something to a great extent. I found them so annoying! They wouldn’t shut up! Try to practice throwing these adverbs into your speech to sound more natural. It takes time to get them right so don’t worry! Difference between SO/SUCH followed by THAT! Difference Between VERY, TOO and ENOUGH! Zak Curious Answered on 29/09/2015. Ana Hero Answered on 06/11/2015.